In this video, I explain why it is important to define your blog audience. Who you write to and what you want from them should drive all blog content decisions. Why is it important to define your audience? Who are you trying to impact ? Use your audience definition to guide topic selection, editorial decisions, calls to action, etc. If you know exactly who you are trying to influence, and you know what you want from them, then it’s an easy step to figuring out how to get the response you desire. Clearly defined blog goals are critical. For example, my goals as a service provider would differ from the goals of an e-commerce website trying to sell product. Using this blog post as an example, I know that I want to attract business owners and marketing executives short on time but interested in learning more about digital marketing. Therefore my content is short and to the point, and includes working examples. Once the reader finds my blog post, I will then use a relevant call to action to suggest they visit the relevant service we offer. Their title or job description. (Their job could be homemaker, purchaser, CMO, etc). Demographics (age, gender, location, etc.). Their pain / a problem you can fix. The most important item on this list is “What Is Their Pain?” If you understand their problems (that you can solve), you will understand their motivations, identity, and how to write to them effectively. 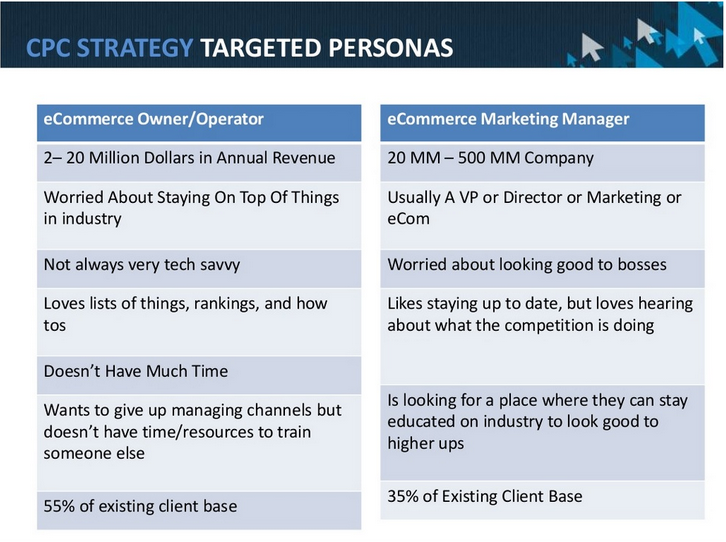 Rick Backus (@CPC_Rick), Co-Founder/CEO of CPC Strategy, presented his ideas about this at the SearchLove conference in Boston in April 2014. CPC Strategy is a retail search agency, and Rick’s blog is a part of the company’s success. Image from Rick Bakus’ SearchLove 2014 Slideshare Presentation. Because his audience is such a well defined niche, if the content is good and useful, it will more easily become known within that audience. The information about audience identity helps you choose topics to write about. The process allows you to make effective editorial calendar decisions. This also helps you know what not to write about. Finally, calls to action have more of an impact on the right audience. Want To Build A Content Program And Measure ROI? If you found this post helpful, and would like more help with your content strategy, click here to learn more about our content management services.